Go to the web page you want to share. Touch the Menu icon button and choose the Share command. The Share Via menu appears, listing apps and methods by which you can share the page. 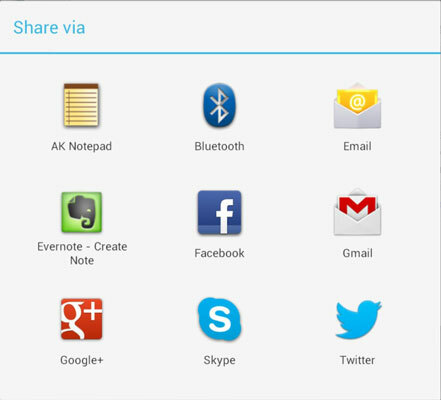 The variety and number of items on the Share Via menu depend on the apps installed on your tablet. For example, you might see Twitter or Facebook appear, if you’ve set up those social networking sites. Choose a method to share the link. For example, choose Email to send the link by mail, or Twitter to share the link with your legions of followers. Whatever happens next depends on how you’re sharing the link: Compose the e-mail, create a comment in Facebook, or do whatever. To share a web page you’re viewing with another Android Beam device, touch your Nexus 7’s back to the other device’s rear (or wherever NFC is enabled on it). To send the page you’re viewing, touch the screen when you see the prompt Touch to Beam. Similarly, another human with an Android Beam–capable gizmo can send a web page to you: Touch your Nexus 7’s back to that other device, and then let the other human touch their screen. The web page is beamed instantly to your tablet, appearing right on the screen.